Annwn is the Celtic Otherworld - the world behind the veil/mask. It is the magical place of perpetual feasting, dancing and music - it is the land of the forever young. It is possible to travel between the human world and the otherworld, which exists out of time and space. In the Welsh Medieval tale "the Mabinogi", Pwyll, Lord of Dyfed meets Arawn, King of the Otherworld, while both are out hunting. Arawn has a pack of shining white, red-eared dogs - the Hounds of Annwn are his totem animals. In the myth, Pwyll and Arawn resolve an argument over a white stag, by agreeing to exchange places for a year. They are magically transformed so that even Arawn’s wife does not know that Pwyll is living in her husband’s place. 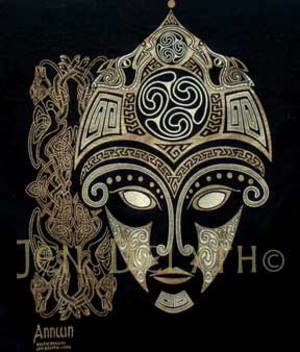 Shape-shifting is an integral element of the Celtic world: The Mysteries take shape in the flux between states, between light and dark, night and day, here and there. The head, as center of spiritual power, had overwhelming significance for all the Celtic peoples. It is conspicuous in their rituals, their warfare, in their stories, and in their art. This Mask is inspired by ancient Celtic bronze warrior masks..